...start tomorrow and go until almost Christmas. Hard to believe that we will start when it is going to be 93 in Denver today and probably end in a blizzard in December. Such is life in paradise. I have nearly 50 students as of today but will end up with many more by the end of the week. Eighteen year olds on their own for the first time in their life are not too organized. I have also had my first "Professor Lindstrom I will not be in class this week" phone call. I think that it is great that parents have taught their kids to be responsible and to let people know when they are not going to be somewhere. 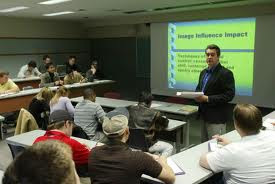 Of course that young man has not heard my "first day of class" lecture. I specifically tell my students that I do not want them to call me and let me know about their cold, their breakup with their girlfriend, their hangover or anything else that does not have to do with class. I end up spending an inordinate amount of time answering e mails about a certain malady or returning phone calls about how their car broke down in Denver. I really do not care. You are either in class or you are not in class. If you are there then I mark you present. If you are not there I mark you absent. I only have enough room on the roster for a check mark and not a detailed description about the battery that went dead on the student's car. I know that they believe that if they give me an excuse then they are somehow excused. There are no excused absences. Either you are there or you are not there. I consider it practice for the real world. I have had as many as 500 employees in the past. If they came to work they got paid. If they did not come to work then they did not get paid. Such is life. Teaching is not a profession. Teaching is a calling. It is so hard to be a teacher and a mother at the same time. I know that they will always remember me.